Marlborough, a city of 39,000, is located at Route 495 and Interstate 290, one of the most dangerous intersections in the Metrowest region. Route 20 and Route 85 are well-traveled roads within the city (which is also spelled Marlboro). The Route 495 and I-290 interchange is dangerous because of the heavy traffic there. I-290 continues west to Worcester, where it meets the Mass Pike. Commuters have to navigate large trucks and business vehicles. On a good day, you can count on traffic to back up at the merge; when a car accident occurs, traffic can stretch for miles. Drivers can become tired, impatient and make mistakes. If you have been injured in a car crash in Marlborough, seek medical treatment immediately. Then contact an experienced Marlborough car accident lawyer to learn your rights. An attorney can help you contact your insurance company, then guide you through the process of obtaining compensation for your injuries. Our lawyers have beeen recognized as among the top personal injury lawyers in Massachusetts. We represent injured clients in Boston and across the state, including in Metrowest communities, including Sudbury, Hudson, Northborough, Southborough and Westborough. For a free legal consultation, contact Breakstone, White & Gluck at 800-379-1244 or use our contact form. Our client was seriously injured in a truck crash in Marlborough. An 18-wheel truck slammed into his vehicle from behind, pushing it into a sidewalk and through a pole. Our client suffered serious injuries and had to undergo an emergency spinal fusion. The defendant had a risk management committee which was unwilling to settle until after mediation with our attorney. At that time, the case settled for $2.5 million dollars. Read more. The intersection of I-290 and Route 495 isn’t the only dangerous intersection in Marlborough. Years ago, the intersection of Hudson Street, Elm Street and Mechanic Street saw many crashes. But the city began requiring drivers to stop from all directions, which reduced the number of auto accidents. Traffic travels fast on certain parts of Route 20. 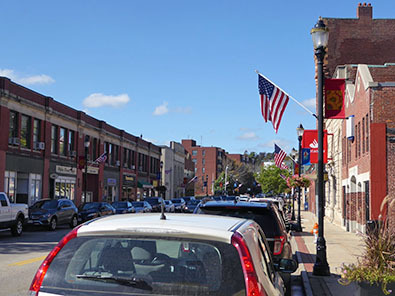 As you approach downtown from Route 495, you can travel down Main Street and pass Marlborough City Hall. Or you can take Route 20 (Granger Blvd) which winds behind City Hall. However you travel, both roads intersect with Route 85 shortly after City Hall. Having two roads helps with the flow of traffic. But drivers still do not always reach a complete stop at traffic lights or at stop signs in this area, creating a high risk for pedestrian accidents. This is a mixed residential and business area, so there are many pedestrians out. Route 85 has numerous businesses and office buildings. Lunchtime creates a rush and many of the businesses - like McDonald’s and Dunkin Donuts - have drive-thru service. Car accidents can happen in parking lots and drive-thru lines, as drivers back out or when drivers open doors onto other vehicles, cyclists or pedestrians. Parking lot accidents are also a concern at the Solomon Pond Mall, when drivers back up without looking or speed through parking areas and garages. If you have been injured by the negligence of another driver, you may be entitled to compensation from the other driver's auto insurance policy, including medical expenses, lost wages and pain and suffering. You may also be entitled to compensation from another responsible party. For instance, if a drunk driver struck you, you may be entitled to compensation from the driver and the bar, restaurant or homeowner who served them. Bars are prohibited from serving to patrons who are intoxicated and can be held liable under Massachusetts dram shop law. If a driver was on the job in a work vehicle when you were hit, there may be additional compensation available from the employer. An experienced car accident lawyer can review the facts of your case with you and explain what compensation may be available for your recovery. Contact a car accident lawyer serving Marlborough as soon as possible. A lawyer can start an immediate investigation to determine how the other driver was negligent and caused your injury. An attorney can do the best job for you when you contact them in the hours after a crash. Speak to a Marlborough car accident lawyer today: 800-379-1244.